Make your own display by gathering your favorite model kits. 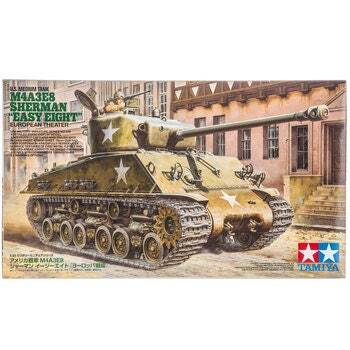 M4A3E8 Sherman “Easy Eight” European Theater Tank Model Kit features the parts and pieces to make a U.S. medium tank with an accurate sloped front, faithfully reproduced surface textures, and a commander torso figure. This plastic model set can be accented and customized with paints (sold separately) to make the perfect model.